(Photo: REUTERS / Amr Abdallah Dalsh)Egypt's Army Chief General Abdel Fattah al-Sisi attends a meeting with Egypt's interim President Adly Mansour, Russia's Defence Minister Sergei Shoigu and Foreign Minister Sergei Lavrov (not pictured) at El-Thadiya presidential palace in Cairo, November 14, 2013. CAIRO, May 12 (Reuters) - Egypt's presidential frontrunner Abdel Fattah al-Sisi said on Monday the Syrian civil war must be resolved through peaceful means, indicating Egypt would not support an armed intervention there, something previously suggested by some Arab states. Most of Syria's political and armed opposition and some Arab states had previously asked for an international military operation in Syria to end a three-year old war. Asked about his views on the Syrian conflict, Sisi said: "We have to find a peaceful exit as a solution." Sisi's comments, in a televised interview with Sky News Arabia, indicates Egypt's future stance on Syria if the former army chief wins, as expected, a presidential vote on May 26-27. Egypt's former president, the Islamist Mohamed Mursi, who was ousted by Sisi last July after unrest against him, had publicly endorsed the uprising and cut diplomatic ties with Syrian President Bashar al-Assad. The current army-backed authorities have accused Mursi of sending Islamists to fight against Assad in Syria. 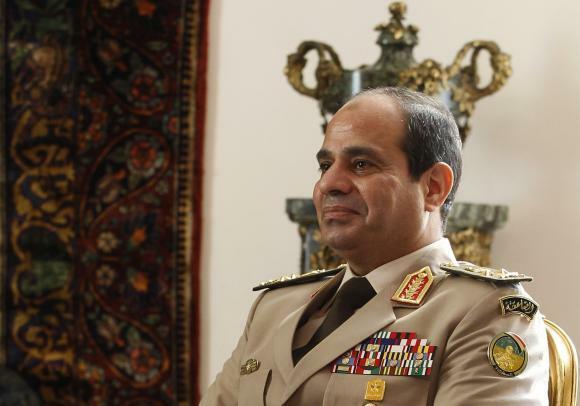 "The number of terrorist elements there created an attractive spot for terrorism," Sisi said.